Following the historic decision by the Security Council on Syrian chemical weapons, an OPCW inspection team prepared to leave for Syria early Monday 30 September 2013. Briefing journalists in New York, Martin Nesirky said that chemical weapons inspectors from the Organization for the Prohibition of Chemical Weapons (OPCW) and the UN are part of the operation to eliminate the country’s chemical weapons programme by mid-2014. The advance team, which arrived yesterday, has begun “securing the sites where the team will operate, especially in outlying areas,” Mr. Nesirky said. “The team has also been considering the health and environmental hazards which they may have to confront,” he added. The team reiterated, however, that the joint mission would provide the necessary technical support to meet those obligations. Meanwhile, a separate team, led by Swedish scientist Åke Sellström, had been tasked with probing allegations of chemical use in Syria. 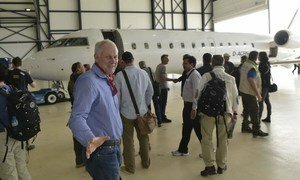 That team left the country after completing its six-day mission, Mr. Martin had said on Monday, and will now move to finalize its report, which the team hopes will be ready by late October. The United Nations team investigating allegations of chemical weapons use in Syria has left the country after completing its six-day mission, a spokesperson for the world body said today.